We are delighted to be shortlisted for Best Distributor in Tech Excellence Awards 2018. We were honoured to win the award last year and really appreciate you taking the time to vote and support us. As a valued partner of DataSolutions, your support is the most important element of our success and we would be grateful if you could take a minute to vote for us to win this year's award. 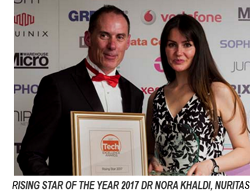 We are also proud to be sponsoring this years' Rising Star of the Year Award! We wish the best of luck to those who have made the shortlist this year.